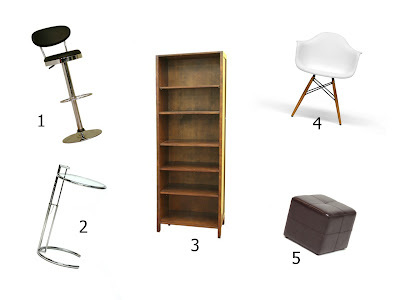 Chicago Furniture | Interior Express Outlet Blog: Cash Strapped Shopper 5 under $50! No matter what it is a great feeling to score a great deal. Nothing is better than walking away with change in your pocket and knowing you are taking home a great item. Once and a while I like to compile some items that are priced so low you can't help but take them home with you. All these items shown are under $50 and perfect for the cash strapped shopper. 1. These bar kitchen stools are made from durable chromed steel and black or white vinyl. At this moment we have both colors on the floor. Priced to sell at $49! 2. Get a great deal on this classic table. Our gray style side table is a top notch reproduction of a classic design. The Eileen Gray side table has sophisticated design, a glass top, and a chrome frame with adjustable height. Take it home for only $46! 3. Available in both a tall or short style these well made TV Side Shelves need to go. Liquidation price is $49! 4. If you are looking for modern home furnishing items, this Pascal white plastic chair with brown wooden legs is the perfect addition to any modern or contemporary dining room furniture living room chair combination. So affordable you can't help but fall in love this chair is only $35! 5. One of our most affordable items this small but sturdy brown leather ottoman will add a sleek, sophisticated look to your living space. You can't beat this price at $25! Do not miss your chance to take one of these amazing deals home with you! Stop by our show room and check out all of our other items!